Click here for a sample of ANC042. Bit by bit and blade by blade, the sparrow builds its home. From branch to eave, streetlight to riverbank, almost any hollow is suitable for nesting. Passeridae in many areas find the dwellings of other birds ample housing, whether deserted or occupied. Though these intruders may be quick to infringe upon another's quarters, they are bold in defending their own. 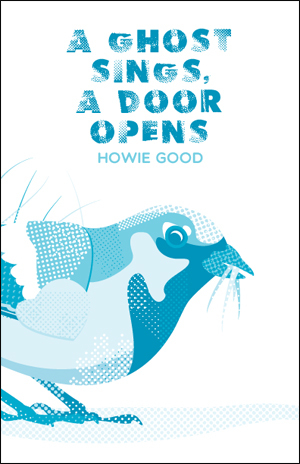 Similar twigs of domesticity and salvaging weave throughout the grass and feathers of Howie Good's A Ghost Sings, a Door Opens. The final entry in a trilogy (or tetralogy, depending on how you look at it), the collection finds Good in somewhat serene territory as he ponders those quiet moments lost within the squall of our maddening times. As always, he splits his musings between spare verse and profuse prose poems; so too does he continue his custom of embellishing the volume with appropriated texts, "dump[ing] them in a growing jumble at the end of the garden . . . misshapen pieces in a kind of extended jigsaw puzzle" depicting a life spent wondering why. ANC042 is out of print.